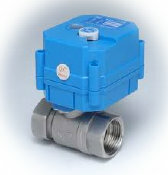 Solenoid valves for most applications. What do you do when your preferred pH / ORP electrode is not available with a built-in preamplifier and you need to send a few hundred feet of signal? Add this preamplifier to your installation and you can go 1000 feet if necessary! Compatible with all Walchem controllers (but not with W-130/230 L series). These probes are easy to use and are very accurate. Ideal for installing with WebMaster ONE and Walmart Industrial Webmaster. Orifice for industrial kettle installations. Essential instrument to eliminate instantaneous vaporization when opening valve to purge the kettle. A wide choice of water meters. Available in most pipe diameters. The Little Dipper 2 Designs Turner is a unique transmitter, precise industrial fluorometer, installed directly in the process pipes. It provides an analog signal output proportional to the concentration of the fluorophore being measured. The Little Dipper 2 is a robust 24/7 sampling device that delivers maximum performance, minimal maintenance, and reliability of readings. The Little Dipper Portable Fluorimeter is lightweight, highly resistant and ideal for rapid measurements in boilers and cooling systems.